We hope you enjoy the designs as much as we do because without you we wouldn’t be here. Even if you only popped in to see if these bags are actually real, we appreciate the time you spent and perhaps you even shared us! Bottom line is, you know this is unique and certainly confuses the eye. We actually have confirmed that it confuses the majority of our furry doggy friends too! A lot of breeds cannot visualize 2D and only see in 3D hence they become very confused at the concept of our 2D Bag. Crazy right?! 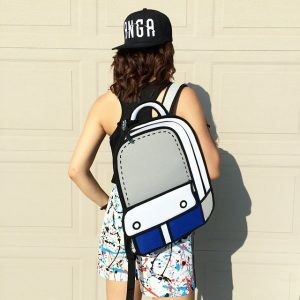 We specialize in creating unique bags with a vivid 2 Dimensional appearance that looks like they came straight from paper. The 2D designs jump right out at you and gives you an amazing allure that you just can’t take your eyes off of. This is your chance to stand out from the crowd and make a bold, powerful fashion statement with these exclusive 2D bags. They’re perfect for school, hanging out, or for traveling. These bags will definitely give you the edge you need to be original, creative and unique. Take your fashion to the next level and claim your individuality! Step away from the norm and stand out from the crowd. Browse All 2D Bags Today!